In some parts of the world, you can visit a planetarium and go on an amazing immersive journey into the wonders of the night sky. In other parts of the world, you can visit a natural wildlife reserve and go on an incredible expedition into the marvels of its fauna and flora. Whether you choose the stars or wildlife, the constant throughout either experience is letting your feelings of surprise and admiration take over. You are a traveler passing through a place outside your usual environment. Gaze at it! Across the globe, conversation on tourism to the Democratic Republic of the Congo (DRC) typically include one of the following keywords: Virunga, Mount Nyiragongo, trekking and mountain gorillas. All indicate a particular form of the activity: ecotourism. And this comes as no surprise! In addition to constituting the second-largest sovereign area on the African continent, boasting a musical talent that continues to influence the contemporary genres of other African nations, and being the birthplace of one of the best African basketball players to ever play in the NBA (Dikembe Mutombo), this French-speaking Central African country of roughly 70 million people is home to five World Heritage Sites. Ecotourism is turning out reasonably well in eastern DRC—where the World Heritage Sites are concentrated—with support from slogans like “Africa’s oldest national park” and “Home to some of the world’s last mountain gorillas.” Statements like these are attractive due to their factual simplicity. They also appeal to international media outlets that stand ready to draw attention to environmental struggles, such as the recent attempt at oil exploration in Virunga Park. But responsible visitors know they must take a leap of faith when traveling in the Congo. Infrastructure around the tourism industry is still not quite established, with only a handful of tour operators working with the country's park management authority, which is severely underfunded. Administrative processing of visas and permits can easily take up to five times as long as they normally should. And connections between different locations are simply grueling. Even so, I contend we must continue to promote ecotourism, throughout the country. Successfully countering major biodiversity threats, such as poaching and a 21st century civil war that devastated the country’s wildlife population, requires inspirational initiatives. AWF’s hard work in the Congo landscape has produced ecotourism to northwestern DRC, even though it is small-scale in comparison to national parks such as Virunga and Kahuzi–Biega. But if you like adventure and are debating your next holiday destination, consider joining the likes of national and foreign post-graduates in primatology, ecology or anthropology, who visit the Congo landscape’s protected areas for up to a month at a time to conduct scientific research. Or, connect with adult vacationers of all ages who now and then book a two- to three-week expedition from Kinshasa—DRC’s capital city—to the Lomako–Yokokala Faunal Reserve and back. The journey in question involves a three-day ride along the majestic Congo River in a 30-ft. motorized canoe, interacting with the local communities along the way with the chance to buy unique local artifacts. 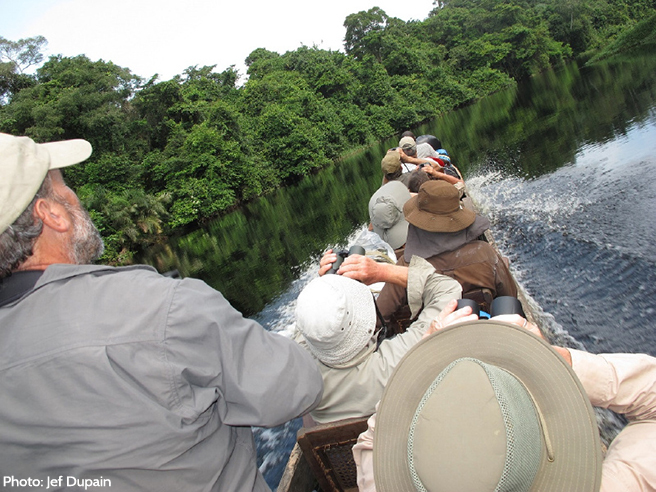 Once permanently back on dry land, you might be lucky enough to spot endemic primates, such as the endangered bonobo or the splendid Congo peafowl, thanks to experienced guides and trackers from the community. The trip’s cost is still high and therefore is an arrangement befitting the well-to-do—but what are the chances of you reaching the stars against those of you reaching the equatorial forest? The name “Lomako-Yokokala Faunal Reserve” is a mouthful, but so is the feast for your eyes. Gaze! Yao Bongoma is AWF's DRC Communications Officer.